Wigwam, in the event you never heard of them, make a wide variety of socks for all occasions. And in somewhat of a novelty these days, all Wigwam socks are made in the USA instead of some dingy foreign factory. I ignored Wigwam socks for years, happily focusing instead on Smartwool and Thorlos. But as fate would have it, the local REI had a sale on Wigwam socks while being out of the type of Smartwools I had hoped to buy to reinforce my winter sock collection. So I took a chance on Wigwam’s Hiker/Outdoor line of socks which are partially made from Merino Wool. I must say, I came to like them. I find the Wigwam socks quite comfortable and they have proven durable. Compared to Smartwool socks, the Wigwam socks made partially from Merino Wool aren’t as soft or snuggly. However, they do a fine job keeping my feet warm. They are also easy to take care of—just toss them in the washing machine on either cold or warm and they’ll come out fine provided you don’t dry them on super high heat. Finally, since Wigwam socks aren’t pure Merino Wool socks, they don’t have the one problem that kind of annoys me at times about SmartWool socks—which is periodically leving bits of the sock behind on the floor when you take them off. Overall, for pure warmth and softness, it is still hard to beat a SmartWool sock. 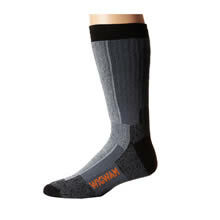 However, Wigwam socks are less expensive and do a good job keeping the feet warm in all but the coldest weather. Wigwam also has a dizzying variety of socks available to meet pretty much any stylistic need. Just note that not all styles of Wigwam socks are partially made from Merino Wool. Many styles consist entirely of various synthetic materials. Wigwam offers a number of socks which are partially constructed of Merino Wool. The wool content varies by sock style, but averages around 30%. The result is that these socks do a good job of keeping the foot warm, preserving some of the softness found in Smartwool socks while maintaining excellent durability. Socks are available for both men and women. Wigwam has a large variety of "everyday" socks. Some are meant for summer, others are meant for work. The socks, however, aren't made from cotton and thus help keep the feet cooler during the summer and warmer during the winter--along with helping prevent stinky feet.